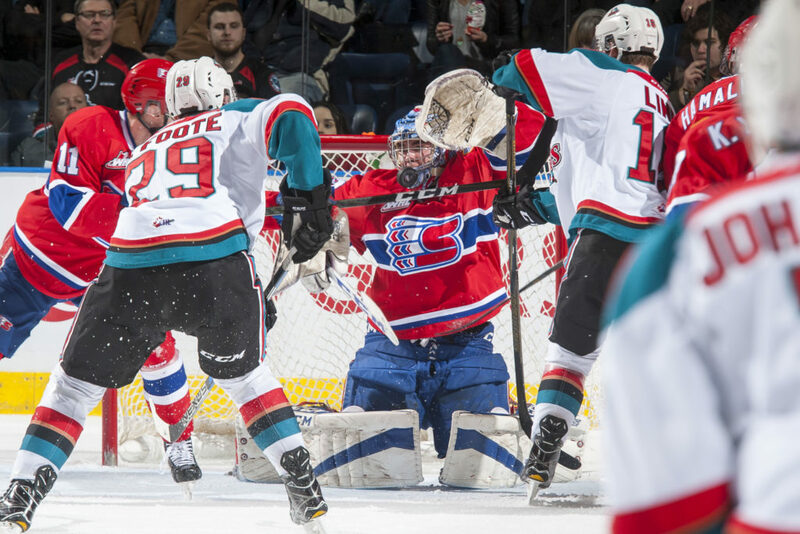 Game Day Preview: The Kelowna Rockets face the Spokane Chiefs for the second of four times this season. The Rockets and Chiefs met last Friday in Spokane, with the Chiefs earning a 4-0 victory. It marked the 5th time this season the Rockets have been shut out this season. These two teams close out the seasonal series in Spokane February 22nd before meeting again at Prospera Place on March 13th. The Rockets are coming off a 2-1 overtime win against the Kamloops Blazers Saturday night. Lassi Thomson scored the game-winning goal on the power play while 15-year-old Trevor Wong scored his first career WHL goal, also on the power play, in the one-goal win. Following tonight’s game, the Rockets host Prince George Friday before travelling to Kamloops to face the Blazers on Saturday. Overall, the Rockets are 5-8-2-1 in 16 games since the Christmas break. The Rockets are 17-15-4-1 in 37 games under head coach Adam Foote. Who’s Hot: Kyle Topping has 6+9=15 in his last 15 games…Nolan Foote has 6+7=13 in his last 12 games….Lassi Thomson has 5+3=8 in his last 13 games…The Rockets penalty killing unit is 45 for 55 in their last 13 road games…The Rockets have points in 13 of their last 17 home games (10-4-3-0). Broadcasters Notebook: Nineteen-year-old forward Connor Bruggen-Cate has been suspended for two games by the WHL for ‘actions in game’ against the Kamloops Blazers Saturday night. Bruggen-Cate will miss tonight’s game and Friday’s against Prince George. Blazers d-man Montana Onyebuchi has also suspended two games for his third-period attack on Bruggen-Cate….Tonight’s game is very unique as it marks the first time that three Kelowna players are on the ice surface at Prospera Place in a WHL game. Rockets forward Alex Swetlikoff was born in Kelowna while Chiefs forwards Jack Finley and Eli Zummack also call Kelowna home. Findlay was born in St. Louis while his father was playing in the NHL….Dan Lambert returns to his old stomping grounds tonight. The second-year head coach of the Spokane Chiefs spent six seasons with the Rockets coaching staff, five as an assistant to Ryan Huska and one as a head coach in 2015….The Rockets have 17 games left in the regular season. Of those 17, 11 are against teams in the BC Division…The team will play three games in three nights March 1st, 2nd and 3rd…The team has been out-shot in 13 of the last 15 games…The Rockets are 5-8-1-0 in 14 games against a US Division team this season. Three of the four wins have come against Tri-City with a single victory over Everett and Seattle…The team plays 6 more games against US Division rivals with three games against Spokane, two with Portland and a single against Everett.…The Rockets have played 16-one-goal games at home this season. Last year they played 15-one-goal games at Prospera Place…The team has played in nine-one goal games on the road…The Rockets are 9-12-2-1 against BC Division teams this season…Five members of the Kelowna Rockets have made NHL Central Scouting’s latest rankings. Lassi Thomson is rated 14th, Nolan Foote is ranked 26th and Kaedan Korczak is 31st. Kyle Topping is 195th while Alex Swetlikoff is 217th, Among goalies, Roman Basran is 11th among North American netminders…..Adam Foote was officially named the new head coach of the Kelowna Rockets on October 23, 2018, replacing Jason Smith.,,The Rockets are 8-11-1-0 when playing the second game of back-to-backs….The team acquired 20-year-old Shael Higson from the Brandon Wheat Kings for 20-year-old Braydyn Chizen and a 5th round bantam pick. The team then claimed 20-year-old defenceman Matt Barberis off waivers from the Vancouver Giants. To make room for Barberis, the team released overage forward Lane Zablocki, who is now with the BCHL’s Vernon Vipers.